From the External Devices window in Studio One, you can configure your MIDI keyboard controller, sound modules, and control surfaces. This article will guide you through setting up your MIDI keyboard controller and sound modules. Note that if you are using a third-party MIDI interface or USB MIDI-controller keyboard, you must install any required drivers for these devices before beginning this section. Please consult the documentation that came with your MIDI hardware for complete installation instructions. Keyboard. In Studio One, a Keyboard is a hardware device that is generally used for playing and controlling other MIDI devices, virtual instruments, and software parameters. .Any device that is used to control instruments, is called a Keyboard, this also includes pad controllers like ATOM. Instrument. An Instrument in Studio One refers to external tone generators that are controlled via MIDI. In some cases, your MIDI keyboard controller is also used as a tone generator. Studio One views the controller and tone-generation functions as two different devices: a MIDI keyboard controller and a sound module. The MIDI controls (keyboard, pads, knobs, faders, etc.) will be set up as a Keyboard. The sound modules will be set up as an Instrument. Control Surface. A Control Surface in Studio One is a hardware device that is designed to control mix functions, like the PreSonus FaderPort-series. These devices are not used to control external sound modules or virtual instruments within Studio One, but rather Studio One itself. A MIDI keyboard controller is a hardware device that is generally used for playing and controlling other MIDI devices, virtual instruments, and software parameters. In Studio One, these devices are referred to as Keyboards, and they must be configured before they are available for use. In some cases, your MIDI keyboard controller is also used as a tone generator. Studio One views the controller and tone-generation functions as two different devices: a MIDI keyboard controller and a sound module. The MIDI controls (keyboard, knobs, faders, etc.) will be set up as a Keyboard. The sound modules will be set up as an Instrument. You can set up your external MIDI devices from the Setup area in the Start page. Before setting up a new Song for recording, take a moment to configure external devices. 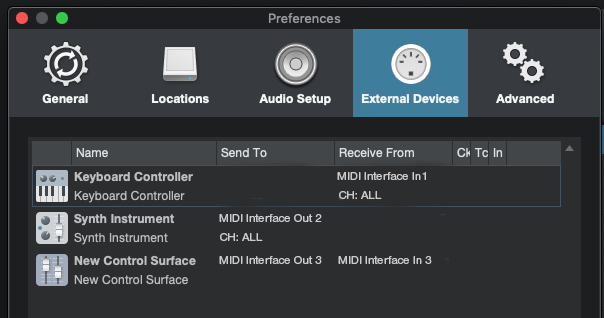 Make sure you have connected the MIDI Out of your external MIDI controller to a MIDI In on your PreSonus audio interface (if available) or other MIDI interface. If you are using a USB MIDI controller, connect it to your computer and power it on. Click on the Configure External Devices link in the Setup area on the Start page to launch the External Devices window. Click the Add button. This will launch the Add Device window. From the menu on the left, select your MIDI controller from the list of manufacturers and models. If you do not see your MIDI controller listed, select New Keyboard. At this point, you can customize the name of your keyboard by entering the manufacturer and device names. You must specify which MIDI channels will be used to communicate with this keyboard. For most purposes, you should select all MIDI channels. If you are unsure of which MIDI channels to choose, select all 16. Studio One allows you to filter out specific control functions. If you would like Studio One to ignore Aftertouch, Pitch Bend, Program Change, or all CC messages, enable filtering for any or all of these messages. In the Receive From drop-down menu, select the MIDI interface input from which Studio One Artist will receive MIDI data (that is, the MIDI input port to which your keyboard is connected). In the Send To drop-down menu, select the MIDI interface output from which your Studio One Artist will send MIDI data to your keyboard. If your keyboard controller doesn’t need to receive MIDI data from Studio One, you can leave this unselected. If this is the only keyboard that you will use to control your external synthesizers and virtual instruments, you should check the box next to Default Instrument Input. This will automatically assign your keyboard to control all MIDI devices in Studio One Artist. MIDI instrument controllers (keyboards, MIDI guitars, etc.) send musical information, in the form of MIDI data, to tone modules and virtual instruments, which respond by generating sound as instructed. Tone modules can be standalone sound devices or can be integrated into a MIDI instrument, such as a keyboard synthesizer. Studio One Artist refers to all tone generators as Instruments. Once you have set up your MIDI keyboard controller, take a moment to configure your sound module. Make sure you have connected the MIDI In of your external sound module to the MIDI Out of your MIDI interface. In the External Devices window, click the Add button. Select your device in the menu on the left. If your device is not listed, select New Instrument. At this point you can customize the name of your sound module by entering the manufacturer and device names. Specify which MIDI channels will be used to communicate with this sound module. For most purposes, you should select all MIDI channels. If you are unsure of which MIDI channels to select, we suggest you select all 16.